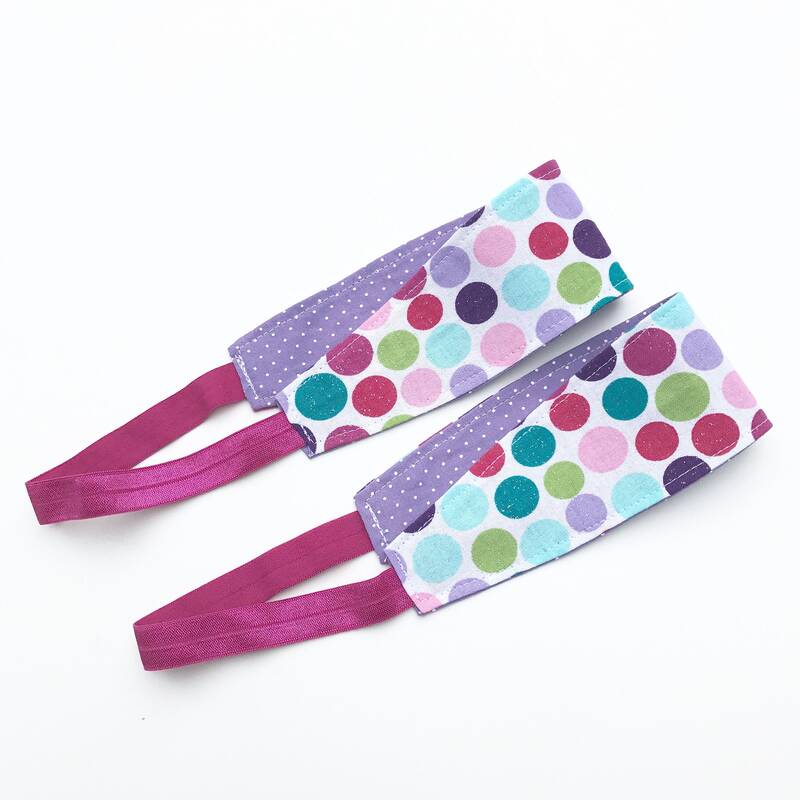 Bold and fun and easy to wear, each Milo and Molly headband is reversible, meaning you get two styles in one! Slightly curved on each side, these headbands look great on hair pulled back or left loose. The combination of fabric and elastic helps keep the headband in place, reducing slipping and sliding. Great for the holidays! This combination: Multi-color dots with metallic silver "glitter" on one side, purple and white pindot on the other, with a pink elastic. The fabric portion of the headband is approximately 11 inches. The elastic on the small size is approximately 7-8 inches, while the elastic on the large size is approximately 9 inches. NOTE: Pattern placement may vary slightly from what is shown in the photos above. Photo Number 5 is a stock photo to show how the headband fits an adult-sized head. Rainbow Unicorn Headband for Women, Teens, or Girls. Reversible Fabric Headband for Yoga, Barre, Gym. 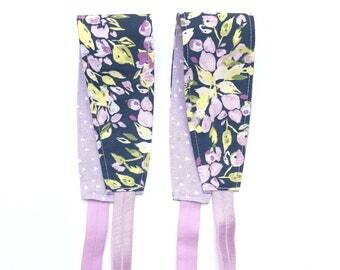 Reversible Fabric Headband. Black and Gold Metallic Hearts. Personalized Tooth Fairy Pillow. Cyan Pocket. Love these chapstick holder so much. These are absolutely beautiful and, oh so comfortable, mittens. The sweater design was perfectly placed...and they're very warm! I accept PayPal, credit cards, and Etsy gift cards, as well as personal checks and money orders. Payment is kindly requested upon ordering. For those paying with check or money order, please note that items will not ship until your payment is received and cleared, which may add several days to your processing time. Custom orders: Custom orders need to be paid in full upon ordering. If you need to cancel a custom order for any reason, the amount of purchase will be refunded minus the amount of materials special ordered for the order (special fabrics, etc.). An order will not be refunded if the items are already shipped. Connecticut residents will see an additional 6.35% sales tax on their order. Photos may not always do an item justice, and fabric and item colors may vary from screen to screen. Because all items are handmade, patterns on fabric and positioning of fabric may vary. Oftentimes the item in the photos is just a sample and you will receive that exact item. Items may fit, hang, or wear differently from person to person than shown in the photos. Keeping the above in mind, if you are truly dissatisfied with your item, please contact me via Etsy convo within three days of receiving your item to return or exchange it. Buyers are responsible for return and exchange shipping fees, and the items must be shipped back within 7 days of receiving the item. If you choose to return, I will refund payment less original shipping. Items must be returned in the exact condition they were received in. Items with stains, holes, rips, or other signs of wear will not be eligible for a return. Items must be returned using delivery confirmation so the item can be tracked. Once handed over for mailing, Milo and Molly is not responsible for packages lost by the USPS and other delivery services. Please contact me as soon as possible if you have a non-delivery of an item. If you would like shipping insurance, please request it prior to ordering. Insurance costs and any additional mail services are the responsibility of the buyer. Please double check the address the package is shipping to. Milo and Molly is not responsible for packages shipped to an incorrect address. Once a package is sent and marked "delivered" the transaction is complete. Items will most often ship within 3 days of receipt of payment but can take longer depending on current processing times. Please check my shop announcement and each listing for current processing times. Custom items will ship as soon as the order is fulfilled. For custom orders, some materials may need to be special ordered and will delay immediate shipping of your items. Fabric will be wrapped in tissue or plastic, depending on the item. Most are shipped in flat or bubble mailers, but packaging will depend on the order size. Shipping is USPS First Class mail for the lowest rates. Shipping prices are based on weight. I try very hard to determine accurate shipping for my items. However, if for some reason there is a greater than $1 difference between your shipping charge and the actual shipping cost, I will happily refund you the difference upon shipment. Please remember that packaging costs plus shipping rates determine shipping charges. Your item will be shipped to the address provided to Etsy at checkout. Please make sure you are shipping to the correct address. Milo and Molly is not responsible for orders sent to the wrong address. Rush processing and USPS Priority shipping options now available for orders with a United States shipping address! If you'd like your order rushed- i.e. pushed to the front of the order docket- you can now choose "Rush it!" once the item is placed in your cart. Rush processing means your item will go out within 2 days of ordering, via USPS First-Class mail (2-5 days time once the post office gets it). If you'd also like it shipped faster, choose "Rush it and send it USPS Priority!" at checkout. Priority mail should arrive within 2-3 days after shipping. Once your package leaves my hands, I no longer have control of how long it takes it to make it to its destination. Shipping times provided by the USPS are averages. In addition, once handed over for mailing, Milo and Molly is not responsible for packages lost by the USPS and other delivery services. Please contact me as soon as possible if you have a non-delivery of an item. If you would like shipping insurance, please request it prior to ordering. Insurance costs and any additional mail services are the responsibility of the buyer. International customers: **As of 1/27/13, the USPS drastically increased international shipping rates. All current shipping costs reflects this change. ** Please be aware that delivery times can range from 1 week to 8 weeks, depending on your location and customs processing in your country. International packages are shipped via First-Class Package International. This service does not come with tracking, therefore packages cannot be tracked beyond the U.S. If you would like a trackable service, insurance, or Return Receipt, please contact me prior to ordering. These services will only be provided at the cost of the buyer. At this time, upgraded international shipping is not available. My shop name may appear on items you purchase. If you have any further questions, please do not hesitate to contact me! I try to respond to convos as soon as I can. Your feedback is encouraged! If you love your item please use Etsy's feedback system to review your item. If you are not truly happy, I would love to hear from you before feedback is left. Reversible Fabric Headband. Vintage Blue Floral. Reversible Fabric Headband. Vintage Purple Floral. Reversible Fabric Headband. Bright Leaf Print. 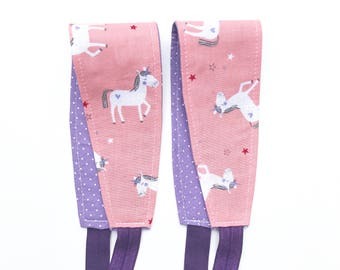 Unicorn Headband for Women, Teens, or Girls. Reversible Headband with Elastic. Gifts Under 20. 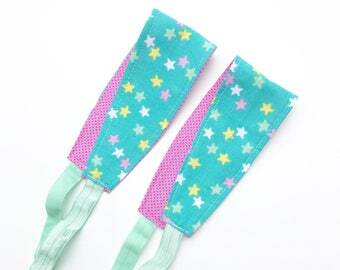 Stars Headband for Women, Teens, or Girls. Reversible Fabric Headband. Gifts Under 20.